Mexico and the EU held the 4th round of negotiations to modernize the Global Agreement. Mexico and the European Union held the fourth round of negotiations on modernizing political and cooperation aspects of the Global Agreement at the Foreign Ministry. 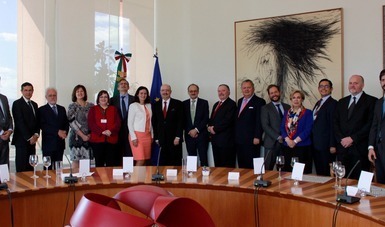 The Mexican delegation was headed by Ambassador Carlos de Icaza, Undersecretary for Foreign Affairs; the European delegation was chaired by Ambassador Edita Hrdá, EU Chief Negotiator and Managing Director for the Americas of the European External Action Service (EEAS). Ambassador Agustín García López, Executive Director of the Mexican Agency for International Development Cooperation (AMEXCID), and Jolita Butkeviciene, Director for Latin America of the European Commission's Directorate General for International Cooperation and Development (DGDEVCO), also participated. Ambassador Hrdá also paid a courtesy call on Foreign Secretary Luis Videgaray Caso. The Foreign Secretary thanked her for the European Union's emergency and humanitarian assistance in the aftermath of the September 7 and 19 earthquakes, including 550,000 euros to assist the areas with the most damage and a cooperation program for the reconstruction phase. The negotiators met for three sessions to exchange views and texts on various political and cooperation issues to be included in the resulting binding document. Specific, substantive progress was made on the political dialogue, corruption, migration, the world drug problem, money laundering, disaster risk management, sustainable development, the environment, climate change and gender equity. Agreement has been reached on most of the issues, and negotiation of the political and cooperative issues will be finished by the end of 2017 as anticipated. Today, it is clear that actors with common interests and values, such as Mexico and the European Union, must join forces to face the shared challenges posed by the international scenario. Together we will be better able to defend multilateralism, combat protectionism and climate change and ensure a better future for our societies. The upcoming conclusion of the agreement will enable us to achieve a closer, broader and deeper political dialogue and will provide better tools for cooperation. In addition, we will have the economic tools we need to achieve a better understanding of our economies, to take full advantage of their potential and to adapt to the current realities of global trade and capital flows. The fifth round of negotiations on political and cooperation issues will be held in Brussels next November.